02:46 — Doctor Who: Peter Jackson names his price. 04:08 — Firefly: Joss Whedon too busy to Kickstart. 06:59 — Doctor Who: Caroline Skinner: GONE! 10:22 — James Herbert: DEAD! 12:35 — Karen Gillan: Joins Adult Swim’s NTSF:SD:SUV. 14:22 — Doctor Who: Offical web site is a cesspit of spoilers. 15:52 — Justin Bieber: YouTube videos of death. 16:38 – Things in Five Words. 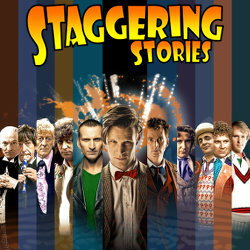 22:47 – Doctor Who: Favourite stories for each Doctor. 117:27 – Farewell for this podcast! 117:58 — End theme, disclaimer, copyright, etc. TARDIS Data Core: Caroline Skinner. Wikipedia: NTSF:SD:SUV (National Terrorism Strike Force: San Diego: Sport Utility Vehicle). Adrian’s Link: Twinkies are coming back. Adam J Purcell, Andy Simpkins and Keith Dunn sit down, maltesered, in front of the Doctor Who episode, ‘Doomsday’, and spout our usual nonsense! BBC: Doctor Who – Doomsday. Wikipedia: Doctor Who – Doomsday. Adam J Purcell, Andy Simpkins and Keith Dunn sit down, spooked, in front of the 2006 Doctor Who story, Army of Ghosts, and spout our usual nonsense! BBC: Doctor Who – Army of Ghosts. Wikipedia: Doctor Who – Army of Ghosts. 02:39 — Doctor Who: Official three-day event in London. 05:54 — Star Wars: Luke, Leia and Han in Episode VII. 07:08 — Doctor Who RPG: First Doctor source book released. 13:36 — Star Wars – Clone Wars: DEAD! 14:58 — Amelia: Favourite name for baby girls in the UK. 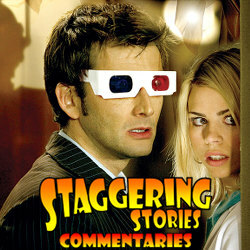 17:34 – Doctor Who: Favourite stories for each Doctor. 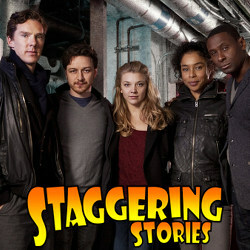 51:18 – Neverwhere: Radio 4, episode one. 86:06 – Farewell for this podcast! 86:38 — End theme, disclaimer, copyright, etc. Cubicle 7 (Makers of the Doctor Who: Adventures in Time and Space RPG). BBC America: Amelia is Britain’s Top Babt Name. Wikipedia: Star Wars – The Clone Wars (2008 TV series). BBC Radio 4: Neil Gaiman – Neverwhere. Andre’s link: How do you pronounce ‘quay’? Adam J Purcell, Andy Simpkins and Keith Dunn sit down, articulate, in front of the Firefly episode, ‘Our Mrs Reynolds’, and spout our usual nonsense! Wikipedia: Firefly – Our Mrs Reynolds.